totally focussed, and was successful in making an Easter card! 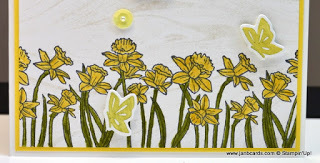 of the daffodil stamps from the You’re Inspiring Stamp Set. on to Hope Stamp Set! top Whisper White Cardstock (CS) layer. to go over the lines on the stems and leaves. easier to stay within the lines! dark design from the Wood Textures Designer Series Paper (DSP) Stack. so I played around with marker pens. 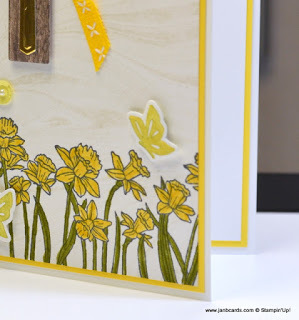 technique – firstly, thumping Old Olive on to Daffodil Delight. like that effect, so I tried it the other way round. and die cut all three. 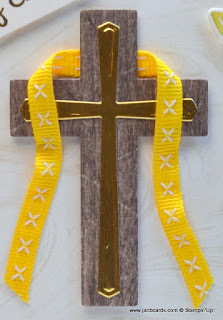 two at either end of the cross bar. 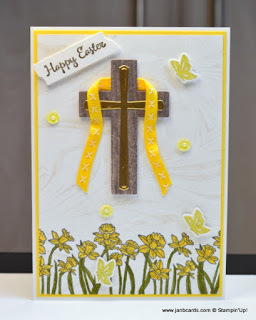 quarter-inch Double-Stitched Daffodil Delight Ribbon. adhere to the top layer, and part of the ribbon. time and used Glue Dots to keep the ribbon tails in position. adhered small Basic Pearls in the centre. 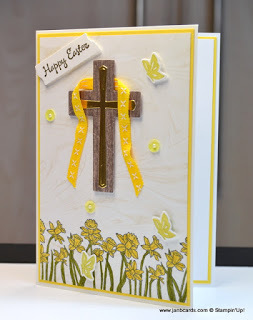 Stamp Set, using Gold Embossing Powder. been designed to look like torn paper! With the exception of going over the lines, I’m pleased with how today’s card turned out! That’s about it from me today. Until tomorrow, happy crafting. 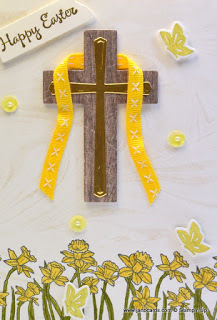 Beautiful Easter card, Jan! It is perfection like always! You and I share the same name, but also the same card making style! I never miss looking at your new card project daily. Very inspiring for me. Hi, Jan. I'm so pleased you like this project. 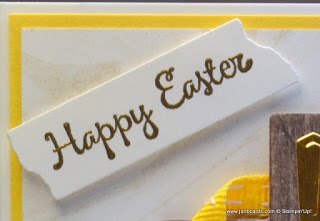 I love this stamp set but I wish it included a HAPPY EASTER sentiment in the banner! I appreciate your support Jan. ☺ Happy crafting, JanB. I can see how much work has been put into this project Jan.